The Cimmerians are a group of historical military combat re-enactors from all walks of life who get together on the third Saturday of each month, regardless of weather conditions, to participate in true-to-life military combat re-enactment using Airsoft equipment while educating ourselves and the public about military history. Over the years 66 fine individuals have been members of the unit. 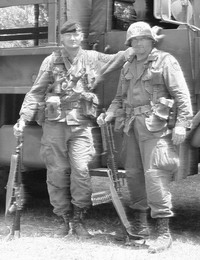 Our mission is to re-enact elements of historical military conflicts with honor, sportsmanship, integrity, and realism. We are not here for the purpose of competing, but rather to promote the overall milsim experience starting from World War 2 to today. Each event should give you the opportunity to take on a role and briefly experience life as a combat soldier. You should leave the operation with a better understanding of how it might feel for the real guys on the line, and perhaps have a stronger admiration for what they endure day-in day-out. In no way is the Cimmerians a political or militia group. The costumes used in Cimmerian operations might make the members look like a militia, but the uniforms are used solely to achieve the historical theatrical re-enactment with as many details as possible to simulate realistic combat conditions. Cimmerian operations are far more engaging and interesting and exciting than any first person title you've seen, because you are immersed in the simulation. The Cimmerian people were a nomadic warrior tribe that marauded the steppes of Russia in the 8th to 7th centuries B.C.. They were a ruthless tribe, credited with the first use of horses in battle. The novelist Robert Howard popularized the cimmerian people when he created the character Conan the Barbarian , an adventurer who hailed from the mythical land of Cimmeria. Conan was the epitome of a warrior: his prowess in combat was unmatched, yet his conduct was always honorable. He was possessed with the soul and instincts of a barbarian, but lived and fought in accordance with a strict moral code from which he never wavered. There were also an ancient people called the Cimmerians in southern Russia of whom little is actually known. They are mentioned in Homer, but they emerge into history only in the 8th century BC when they were driven by the Scythians from their former home in the Crimea and came to the region around Lake Van (in present-day eastern Turkey). Defeated in 634 BC by the Scythians, the Cimmerians swept across Asia Minor, plundering Lydia and breaking the power of Phrygia. The biblical Gomer may be the eponym of the Cimmerians, and they are mentioned in the inscriptions of the Assyrians, with whom they warred. The unit has taken this nick-name in honor of the fine warrior tradition. The Cimmerian Philosophy can be summed up in one word: HONOR. The goal of the Cimmerians is to conduct historical re-enactments for the purpose of education and enjoyment, in a safe and friendly environment, with the highest degree of honor possible. We HONOR those who have served by remembering their hardship and sacrifice. Conan's robust character was the perfect backdrop to form the Cimmerians. The club was originally founded in 1992 by Kirk Denebeim, Max Feischer, Ed Denebeim, Keith Denebeim, Sterling Hada, and Lance Hall. 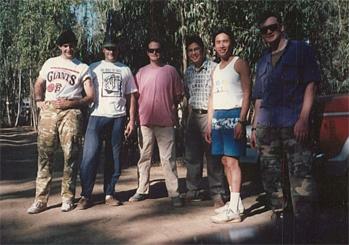 These six paintball enthusiasts first formed the Cimmerians as a non-competitive paintball group. The group originally met at commercial paintball fields once each month to participate in conventional walk-on events. Then in 1997, the Cimmerians discovered Airsoft and everything changed. The popularity of Airsoft grew quickly in the Cimmerians organization. By 1998 the Cimmerians had completely abandoned their paintball guns in favor of Airsoft. With this, the Cimmerians also changed from casual paintball style club into the private Airsoft-based theatrical and military historic re-enactment group that it is today. The longevity of the organization and the enthusiasm of its members is a great source of pride to every Cimmerian. The Cimmerians is one of the first, if not the oldest, Airsoft-based re-enactment organizations in the United States of America. Presently, a dedicated group of more than 40 individuals meet regularly at monthly Cimmerian operations. Compatible operators who wish to try historical military re-enactment and small unit tactical simulations are encouraged to participate with the Cimmerian's and our mission of education through re-enactment of historic combat scenarios. All potential participants should be advised that Cimmerian operations require a far different mindset than paintball, as well as a particularly high degree of fidelity and personal integrity. We take honor seriously, and any violation of the Cimmerian Rules of Engagement or Cimmerian Code of Conduct at any Cimmerian operation will result in the immediate dismissal of the participant from the AO, and the violator will not be invited back. Cimmerian operations involve more realism, adventure, and substantially less expense than other types of events such as paintball. To achieve the level of realism, conventional paintball and "speedball" fields will not fit the bill. Cimmerian combat re-enactments are held legally with permission in national forests, land managed by the BLM (Bureau of Land Management), Federal range lands, and on private property. Several re-enactment AOs are located in the Sierra Nevada range, near Auburn, California, and the Nevada desert outside of Reno, Nevada. During the warm weather, Cimmerian operations include at least 3 camping trips that span an entire weekend. These camping weekends are the ultimate Cimmerian events! Cimmerian operations typically run all day long, with several evolutions of combat re-enactment. Then, it's time for the camaraderie of the staging area or campsite, where combatants relax--still immersed in the role of combat soldiers--after an exciting day of fighting and swapping stories of the day's action. Cimmerian camping operations that include camping are the troops' favorite times. After the last battle of Saturday is when the campfires begin and the food pours forth for the traditional Saturday night potluck we call the "Feast of Crom". Good food and drink accompanied by friends, both new and old, gather around to recount the day's action. The stories continue into the night. These camping weekends are particularly special and there's certainly nothing else like them! Many Cimmerians camp on Friday nights at every monthly operation, even when it is not an officially designated camping operation. Every operator is welcome to join the campers on Friday nights. Since Cimmerian operations are held in the natural outdoors, Mother Nature provides the areas of operation, and she has been kind enough to provide some wonderful places in which to bring combat history to life once again. In return, it is only fair that Cimmerians and guests help Mother Nature preserve the environment. All honorable Cimmerians feel this is not only the right thing to do, but is a duty as well. All operators who participate in Cimmerian re-enactments may use only fully biodegradable BBs, which are available from many Airsoft vendors as well as at the AO at Cimmerian operations (we make every effort to make the availalbe through partnerships with the retail community). When you participate in a Cimmerian operation, you are never required to use "field ammo" as long as you use bio-degradeable ammo. No plastic or metal ammo is allowed, and any participants discovered d using anything but full bio BBs will be immediately expelled from the AO. Cimmerians and guests must always pick up BBs spilled in the staging areas or field, as well as other trash that is spotted, whether it is their trash or not. By doing this, Cimmerians not only help Mother Nature, but they help themselves and the organization by ensuring unencumbered access to these pristine fields in the future. The Cimmerians is based out of the San Francisco Bay Area in Northern California. Cimmerian members are located throughout California and Nevada. We operate primarily on public lands of the National Forest or BLM. Cimmerian operations are open to all new and veteran Airsoft operators alike. However, in order to maintain the highest standards of re-enactment and conduct, participation in Cimmerian operations require registration with our website and executing a legal waiver of liability, which is part of the online registration process. If you are interested in participating in a Cimmerian operation, please click the "Sign Up" link at the top of the home page to get started. It is important to keep in mind that Cimmerian operations focus on the spirit of education, respect and honor for our military heroes, therefore all operators are expected to behave correctly and conduct themselves in a manner consistant with the Cimmerian Code of Conduct. The Cimmerian Airsoft Assoication reserves the right to monitor the behavior of participants, and expects all participants to abide by CAA's official rules. Spectating at a Cimmerian operation is not feasible due to the nature of our operations, and the environment we seek to create; it is a distraction to re-enactment roles and detracts from the realism. Everyone who participates in a Cimmerian operation is expected to be properly attired, equipped and ready to engage in combat re-enactment either as a combat operator, or in special circumstances a non-combatant. Occassionally, Cimmerian operations employ the use of "non-combatants" as part of the scenario in the case of a POW, combat journalist, hostage, etc. If you are interested in applying for a role as a non-combatant, please contact the CAA as part of your registration process for a particular operation. All individual participants must be at least 18 years of age to operate with the Cimmerians, and under no circumstances can we make exceptions to this rule. California law requires that an individual be at least 18 years of age to purchase an Airsoft weapon, so the Cimmerians cannot encourage otherwise. Because Cimmerian operations are conducted on private or public land, each individual participant must be responsible and liable for their own safety. Effecitve Jan 1, 2011, the Cimmerians have made accomodations to allow for the participation of minors age 15 or older. If you are a current member of the Cimmerian Airsoft Association, you may bring with you a minor age 15 or older with an appropriate waiver filled out by the parent or guardian. If you are a Player in Good Standing (PLIGS having operated with the Cimmerians previously), you may bring with you a minor age 16 or older (CAA membership has its privileges). Anyone who brings along and is responsible for a minor must have them attached to you at all times. They do everything you do, and go everwhere you go, absolutely without exception. If a minor is found to be outside of his/her guardian, this will be considered a rules violation and be eligible for removal from the operation. The Cimmerians are trying this out for the first time in an effort to stay current with the airsoft community, and to enable many of the children of our current Cimmerian members who have been watching their fathers operate for many years. The Cimmerian's reserve the right to modify this as we see fit or more information is made available on the challenges this brings.